Military officials say a planned test is taking place, and it will last until Nov. 12. On Saturday night, a non-armed missile was fired from the USS Kentucky, according to the Pentagon. The USS Kentucky is a ballistic missile submarine. The Navy Strategic Systems Program conducted the test off the coast of Southern California. “What was weird, the tail was light and wide and it got bluer and bluer. Then it just burned out and went away,” McKee said. Los Angeles International Airport issued a statement announcing military airspace west of LAX will be active for a week. The test will cause traffic route limitations, and LAX will temporarily deviate from over ocean-operations, according to the airport’s statement. With what you see on the streets of Los Angeles one would think this wouldn’t concern them at all. That bright light was merely a ray of hope for California as we descend into the depths of hell. Isn’t it a little odd that with all the cameras we now carry, there are no flying saucers? It looked exactly like a missile. 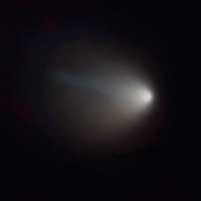 It looked nothing like a meteor (meteors move quickly across the sky) and alien theorists are complete crackpots. Are they “crackpots”? Or are they more intelligent than others–while also possessing the ability to conceive quantum-based “outside-the-box theoretical orientations”? With an IQ of 156, a doctorate degree and a very cohesive lifestyle (financially, spiritually, emotionally, mentally, physically); I must absolutely be a “complete crackpot”. Or, it could be another option: it could be that there was a divine creator who designed a vast and infinite universe that is teeming with such an extensive variety of life—that many galaxies and planets are in fact populated with beings that are both more–and less–advanced than the populace of earth. Or, we could use as an example Dr. Steven Greer: As the Director of Pediatric Emergency Medicine at a large hospital in North Carolina, he spotted a UFO on the way home from a staff meeting. He resigned from medicine and formed Project Disclosure. He has been married for nearly three decades and is busy raising four daughters. Or, Alfred Lambremont Webre; international attorney; stable long-term marriage and prima facie conspiracy theorist. I could go on…..many plasma, particle and astro-physicists can be added to this group quite easily; it is a formidable list. Sweeping generalizations that label everyone “complete crackpots” and consider no outside information-is a sign of the lack of ability to engage in and interpret social exchanges and conversations-while remaining unbiased. A sort of ad hominem fallacy–due to a lack of finesse and intellectual capacity regarding how to interface with the more educated–while maintaining a high degree of civility. I would say the jury remains out on this one. But I would recommend consideration on why they diverted all air traffic around LAX for a period of one week into an adjusted flight pattern. If it was a planned launch—and our missile–why would this be necessary? My brother reported road closures in LA also. Something from the outside—and unexpected? How far outside? Russia? China? A unknown hostile far-outside force? Always be skeptical when someone recites their resume in order to get a point across. Particularly when that point is the plot of a Will Smith movie. They have done before. I just figured their own insecurities. I for one do believe in possibility of a more intelligent life on other planets. Now that being said I have to laugh at your reference to intelligence. Careful there. You are yourself labeling by saying that somehow if you are smart you are above it and couldn’t be subject to the mere problems of mortals. So your argument doesn’t quite necessarily hold water. I have seen the pictures and talked to people that were in the area and it sounds like a standard missal launch. You can see a object moving with a cone behind it. I would suggest you watch a rocket launch sometime. Thank you for illustrating my point so verbosely. If I may further refine it for your benefit: Jumping to UFO conclusions is complete crackpottery. We have no proof of alien life ever visiting earth in spaceships. Skipping over OBVIOUS explanations (how many missile launches have we all seen from Vandenberg?) and without hardly a whim of further inquiry deciding a streak in the sky is alien life in a spaceship (which has never provably been seen before) is crackpot nonsense. I judge success by w2 not IQ. There used to be a guy in my office who would spend his days taking iq tests. He made no money, but boy was he intelligent. The rest of us didn’t know our its and ran rings around him. @ achillesheal, Wait? So he got to play on the computer all day while you guys ran rings around him working? Just asking…..
yes..we were all commission sales people. The company didn’t care if you wasted time. If you didn’t meet your quarterly numbers you didn’t have a job for long. Just curious, what size tin hat do you require?